1960s McDowell Craig tanker refinished in gloss white with optional custom glass tabletop. This classic double pedestal desk features many utility drawers, one filing drawer, one locking stationary drawer and two letter trays. All original aluminum hardware, brushed to a shine. Heavy-duty, yet sleek Mid-Century Modern styling. Please note: 1/4 tempered glass top is optional at $200 up-charge. These images are samples of our custom work. 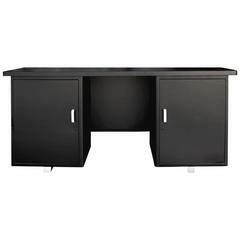 Each desk is custom refinished to order. Please allow 3-4 for production. Dimensions: 30" D x 60" W x 29" H.
The Michigan-based furniture maker Steelcase has a long and distinguished history, but collectors focus on its works from the 1950s to the ’70s, when, along with such companies as Knoll and Herman Miller, the firm helped define the aesthetics of American mid-century modernism. Steelcase was founded in Grand Rapids in 1912 as the Metal Office Furniture Company, promoting steel desks and other furnishings as safer, fireproof alternatives to wooden pieces at a time when smoking in the workplace was common. Boston’s first skyscraper — the 32-story Customs House—was furnished by the company in 1915. Frank Lloyd Wright turned to the firm in 1937 to fabricate the enameled metal chairs and desks for his Johnson Wax Headquarters in Racine, Wisconsin. In the 1950s, when Steelcase formally adopted the name it still uses today, the company developed a sleek and functional style employing rectilinear chrome frames for glass-topped tables and upholstered seating pieces. 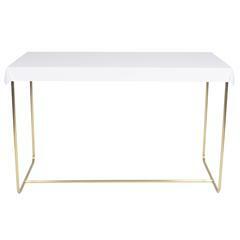 The look is similar to that of the minimal, Bauhaus-inspired designs of Florence Knoll. By the 1970s, Steelcase had enlivened its styling, offering such pieces as chairs and side tables, designed by Gardner Leaver, with circular bases and curving supports. As you will see on these pages, Steelcase designs offer a perfect foundation for a modernist decor, with a touch of flair. 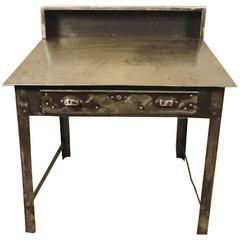 A mid century modern steel desk or work Panel leg desk table which has been completely restored. Newly powder coated in black with a new white laminate top. Custom-made desk for thoroughbred horse racing Jockey Willie shoemaker. 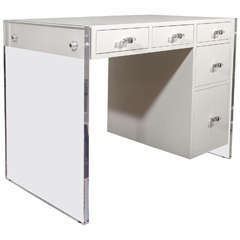 Desk has been made with stainless steel and lacquered wood. 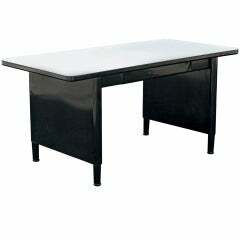 Custom white lacquer desk with Lucite side panels. Interior drawers are spray lacquered white. 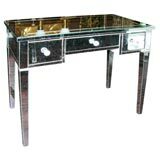 Hardware is chrome and Lucite.